Apple analysts are raising their targets for the stock. Is it undervalued? Fortune's Philip Elmer-DeWitt is back with his survey of analyst price targets for Apple (NASDAQ:AAPL) stock, and one thing is clear: The sentiment toward the stock has seen a significant uptick in optimism. Here's what you need to know. Sixty four percent of the analysts surveyed by Philip Elmer-DeWitt have price targets above $100 a share. 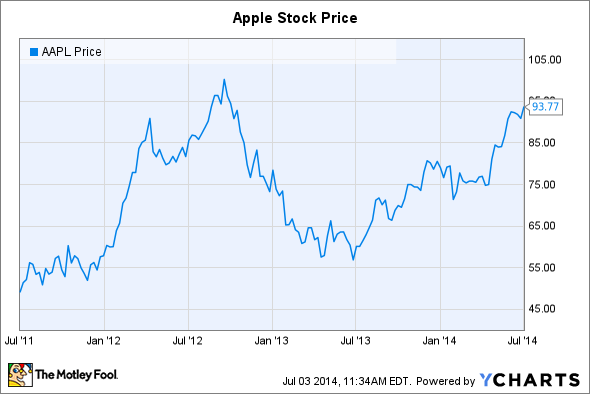 The average price target for Apple stock is $101.49. Before we award any credibility to analyst price targets, it's important to note their weaknesses. The consensus price target for Apple stock over the past several years has arguably been of very little use. As Apple soared toward a presplit $700 in early 2012, a handful of analysts were predicting the stock could reach $1,000, pulling the consensus upward. But when Apple shares began to plummet toward the end of 2012, price targets did too. Are analysts simply chasing the stock price? Further, the idea of a one-year price target, in and of itself, is fundamentally flawed. In the short-term, there are simply too many factors that can influence a stock price for one-year targets to be of any use. The best approach to making any estimation about a stock's value is to simply come up with a ballpark idea of an asset's intrinsic value. Then investors can buy shares when they trade at a margin of safety to this figure, leaving room for a bit of error in your calculations. This takes shortsighted speculation completely out of the game. I could say that analyst price targets are at least useful for helping investors predict where the stock will go in the short-term. Frankly, however, I don't care where any of my holdings go in the short-term. Investors with a Foolishly long-term time horizon want one thing: intrinsic value to increase at meaningful levels over time. After all, price eventually (notice the lack of time frame here) follows business value (most of the time). So, how in the world can we make any use of analyst price targets? I like to look at why analysts have certain price targets. If they are bullish, why are they? If they are not, why? This gives us some interesting material, and we can analyze it to see whether or not it could change the way we think about the underlying business. 1. Favorable upgrade terms from carriers. As Elmer-DeWitt notes, BTIG analyst Walter Piecyk recently increased his price target for Apple stock 30%, from $86 to $112 (yes, that's more than 10% higher than Apple's all-time high). Key to his reasoning is that smartphone leasing plans -- particularly at Verizon and AT&T (NYSE: T) -- are offering more favorable terms to users and will allow a much higher percentage of subscribers to upgrade their phones with as little as 0% upfront. At AT&T, for instance, Piecyk estimates that usually about 20% of subscribers are eligible for an upgrade during an iPhone launch quarter. This time around, however, Piecyk estimates that a massive 65% of AT&T's postpaid subscriber base will be eligible for an upgrade. 2. Hot, new products. A number of analysts have expressed great confidence in Apple's iPhone 6 models. As the first smartphones from Apple in the fast-growing category of phones with displays larger than four inches, analysts believe the alleged 4.7-inch and 5.5-inch iPhone 6 will be a blockbuster hit across the globe. Then, of course, there is Apple's alleged iWatch that some analysts are starting to factor into their estimates, too. Most of these analysts seem to believe the new category will be wholly accretive to Apple's business. Both the iPhone 6 line and Apple's iWatch are expected this fall, with most speculation pointing to an iPhone 6 launch in September and an iWatch launch a month later. 3. Apple's aggressive share repurchase program. Since Apple initially introduced its plan to return cash to shareholders in 2012, Apple has expanded it twice. While two dividend increases were nice, it's the expansion to Apple's share repurchase program during this time that is really adding value. In total, Apple's board of directors has authorized the company to spend $90 billion by the end of calendar 2015 to repurchase shares. Fortunately, Apple was aggressive in using much of this authorized cash for repurchases when Apple stock was trading in the post-split $60 to $75 range. These are all great points. Does this mean Apple stock will reward investors in the next 12 months? I have no idea -- and I don't care to guess. But these are all great reasons why the stock appears to be undervalued and that, over the long haul, the stock should reward investors.